Don’t erase this title from your to be read stack – Joyce's mystery and fiction book reviews with some non-fiction too! Elly Griffith’s Ruth Galloway series is up to its ninth book. I have been reading about Ruth from the very first novel and have fallen in love with this bright, flawed, human and quirky scholar of bones and archaeology. Each book gives the reader a chance to catch up with Cathbad, a Druid; Nelson, a DCI and his wife Michelle, along with Judy, Clough, Kate and many others in the academic, police and local world of Norfolk. The books are best read in order for full enjoyment. 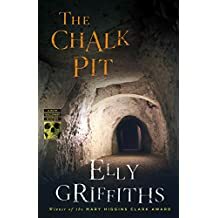 Start with The Crossing Places and come up for air after you spend time underground in the latest, The Chalk Pit. A favorite series of mine! Totally agree! Brilliant series! Who is your favourite character? It is so hard to pick just one! I really enjoy Cathbad but also Ruth in all of her own version of quirkiness. I always want to know what is happening with Nelson too. This has to be one of the best series I have read.